Imagesetters were the Tyrannosaurus Rex of graphic arts service bureaus in the 1980s. They did everything bigger, better, faster and cheaper, and took the commercial printing world by storm. They were the first wholly digital commercial output devices which used lasers to create high resolution films for the industry. They are basically giant, black and white film processors that use photo-based film and photo chemistry and are therefore, like the dinosaur Kodak, fast becoming all but totally extinct. So why are imagesetters relevant to today’s fine art printmakers? Why is it a problem they are going away? In one sense it is not. Most printmakers are artists in their own right, and as such are scrappy, persistent, creative, industrious, loners. We figure out how to get things done, regardless of the technical difficulties and limitations. Were there to be no more aquatint screens or intaglio presses available tomorrow, you could leave it to a printmaker to find a way to work, invent a solution, plod on, and keep the tradition alive. When you’re the only one in the studio who is aware of the difficulties you face, and cares, it’s lonely, but the energy of overcoming the challenges is exhilarating and keeps us going forward. The advent and subsequent maturity of inkjet technology has put most imagesetters out to pasture long ago (and sent quite a few south to Mexico as well). Yet, nothing has quite come along to completely replace their capabilities. While inkjet printers are perfect for creating prints, digital negatives and film positives, the dot created by inkjet technology is not at all comparable to what the behemoth imagesetters can do. Inkjet output, while lush and pristine at arms length, are smeared and fuzzy when you look at it under a loupe. When transferred to polymer plate, these fuzzy divots turn the photopolymer mushy, versus the hard, solid points required to create a good, durable plate matrix that will withstand the pressure and repetition of a professional intaglio printing press run. The commercial printmaking industry has found other, “direct to plate” methods that has made film, and thus imagesetters, obsolete. However direct to plate is very expensive and so there is still a vital need for such technology to produce aquatint screens within the fine art printmaking community. Aquatint screens are high resolution dot screens, used to produce a random pattern of precise dots on polymer plates. Aquatint screens are analogous to the rosin dust used in the step of “dusting” plates, with copper plate photogravure to create a similar, high resolution, random dot pattern. They are often used in polymer platemaking using the ‘double exposure’ method popularized by modern printmaking pioneer, teacher, and author Dan Welden. Using this method, first the plate is exposed to the aquatint screen, then to the image positive. 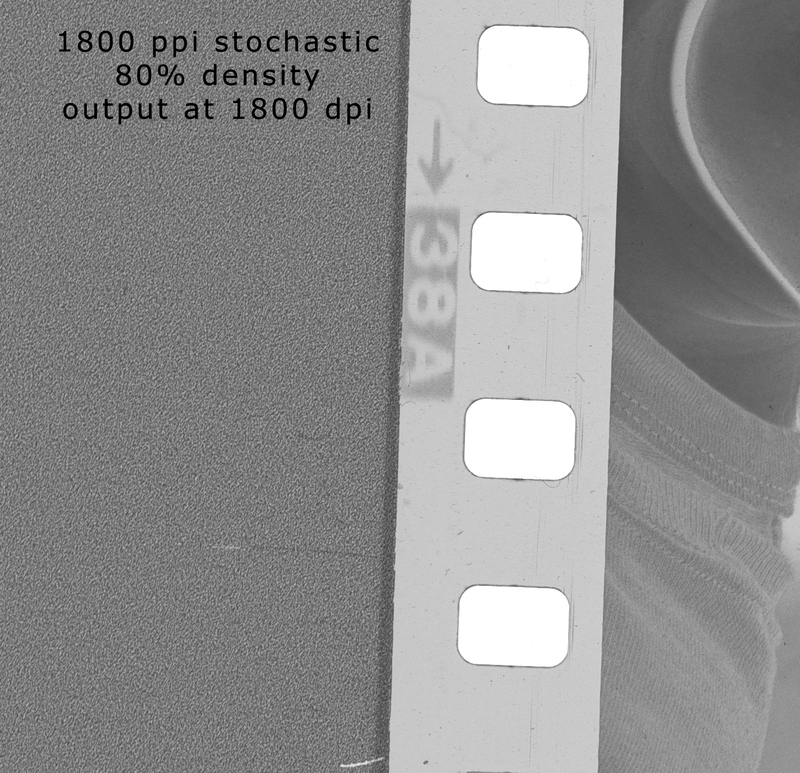 The dot screen allows ink to get distributed evenly throughout the plate, then the film positive image creates the bias and distribution of light or dark, depending on the image. Dan is a marvelous instructor and legendary in the art of printmaking by the way, and if you have the opportunity to hear him speak or take a class with him, do not miss it. So, one of the keys to creating rich, uniform, continuous tone intaglio prints is to have a well-made aquatint screen. At Intaglio Editions we invested in customizing the highest resolution aquatint film we could get for our process to create some of the most continuous tone, photogravure-quality intaglio prints from polymer plate. Nothing we have found commercially is as fine, nor as smooth. Unfortunately, we were never in a position to produce or sell our custom aquatint film commercially. It wasn’t what we were interested in doing and the vendor who produced them for us has since proven disinterested or incapable of living up to the standards we need. Luckily there are still a few imagesetters being maintained and kept in production, and there are still a number of fine art printmaking supply companies offering either generic or trademarked aquatint screens they will sell you. If you find a screen you like, buy alot of them quickly. Rumor has it the industrial-grade, infrared film used in this process will soon stop being manufactured. When this happens, what will become of the polymer photogravure process is unclear. We could all settle for more graphic-arts looking prints, print using other alternative processes such as platinum and palladium, or go back to creating copper gravure plates using rosin dust! My sense is it will go back to the way things were done during the time of Albrecht Durer, the founder of printmaking, where artists would go to the technicians and, working with them directly, would have their images engraved professionally by the artisans who know how to do it best. Much like a conductor might guide an orchestra to the proper nuances and toward the desired finale. This approach is not for all printmakers where the do-it-yourself spirit is high. But it can be much more cost effective than re-inventing the wheel. Dan Welden once asked me, do you want to be the artist wearing the beret on his head, or the guy with plunger in his hand? At the time I wasn’t sure, but my answer today is, both. As collaborators we can do so much more, so much better, and do it more consistently than we ever could on our own. So what killed the very last T-Rex? My guess would be loneliness.